The first ”special version ” of the Pagoda SL straightaway lost its pagoda roof and became something of a multicultural design experiment, a successful one in the view of this author. In 1964 the young American stylist Tom Tjaarda, who came to Turin to produce designs for Pininfarina in 1963, was entrusted with a very prestigious project by the Italian coachbuilder. 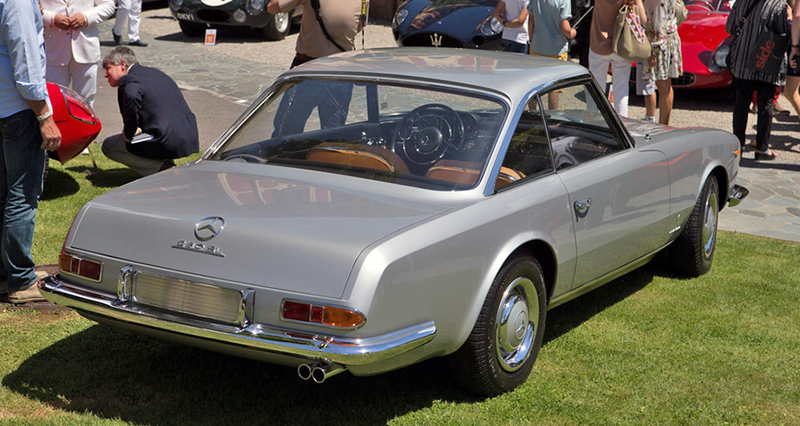 He was to come up with a Pininfarina custom model based on the 230 SL. 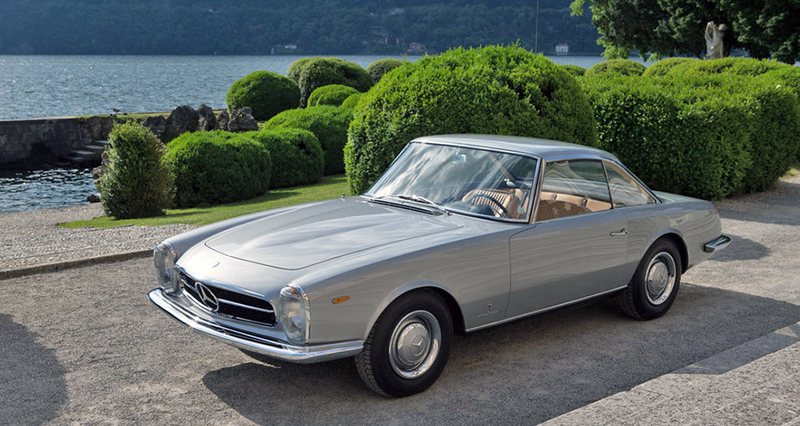 Pininfarina had taken up the gauntlet just two months after the 230 SL was unveiled in Geneva. In a letter to Karl Wilfert, which the latter presented to the Board of Management in May 1963, the world famous coach building firm asked to be allowed to produce its own custom-bodied version of this vehicle. A majority of the Board members consented to this and Tjaarda set to work. 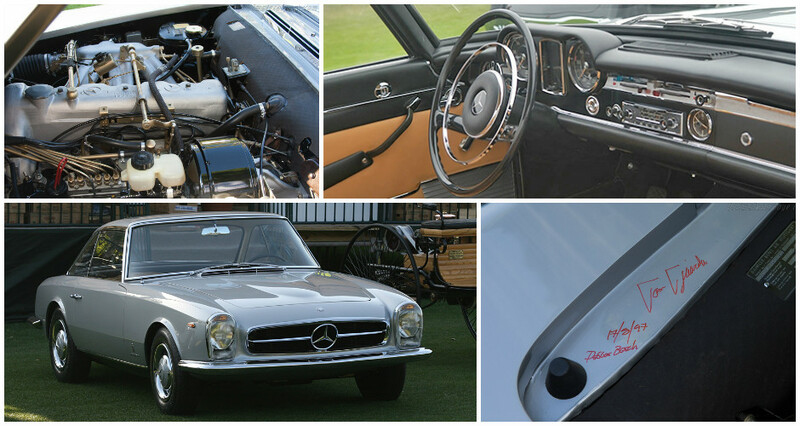 In his version the SL shed its pagoda and became exclusively a coupe. Although Pininfarina had been thinking of building a limited edition, this model has destined to remain a one-off however. Tjaarda’s creation retained the grille and headlamps of the original, but he raked the grille more sharply, sculpted the wings and made the sides more bulbous and thus wider, while the engine hood became narrower and shorter. The rear was reminiscent of the Tom Tjaarda-designed Ferrari 330 GT 2+2, but without taking away the distinctive personality of the 230 SL. Inside, Tjaarda left the dashboard unchanged, but the interior as a whole bears the stamp of elegant Italian hand craftsmanship. The design tapers gracefully and terminates at the unique tail light assemblies. Full width bumper and wide European style number plate housing contrast with the original design. Roof is fixed and the large glass area creates a light airy interior space. After long wanderings, this unique specimen was eventually bought by its present owned Weston Hook of La Jolla, California. Initially when Pininfarina put it on show at the Turin and Pans Motor Shows in 1964, about thirty potential buyers had attempted to get their hands on it. In the end it has acquired by German press baron Axel Springer who one year later passed it on to his ex-wife Rosemarie. Next the Pininfarina SL went to Monaco, then to Palm Springs, where it was bought by Joe Morell. Morell first painted it black, then later on gave it a makeover in a rather unbecoming shade of red. While Pininfarina left the dash essentially alone, they worked their magic on the remaining trim and seats. Anyone who has spent time in a 1964 Ferrari 2+2 will be at home in this Pagoda. The seat design is very similar to the 2+2 and other design elements abound. Designer Tjaarda signed off on the firewall at Pebble Beach in 1996. ← The 108 chassis: The perfect entry level classic Mercedes?